Whiteboards across America are currently full to bursting with the scenarios and machinations of the National College Athletic Association Division One Championships, which is, apparently, a basketball tournament. Across the country sports fans go AWOL for the month as they construct their own brackets to try to predict the direction the results may take. While the Whisky Waffle boys are not so interested in the basketball, we are somewhat curious about the format. So, with much excitement, we present our own spin on the competition: March Whisky Madness! Lagavulun vs Pappy Van Winkel! Ardbeg vs Kilchoman! Jack Daniels vs Knob Creek! Who wins? You decide! Starting now, and finishing… whenever we finish, we’re putting the vote to the people! Through comments on this post and on social media we’ll tally up support for each whisky to decide who will progress to the next round. Then we’ll post the second round and go again! There is no criteria to your vote – decide however you like! If you’ve not tried one before, bad luck for that whisky! If you don’t want to vote on every match up – just skip that one! If you own a bottle or two, why not set up a head to head tasting to truly decide! Post a comment with the list of your choices, or if you don’t want everyone knowing your opinion, email us at whiskywaffle@gmail.com We’re also constructing an email list for each round, so send us an email if you’d like to be included. 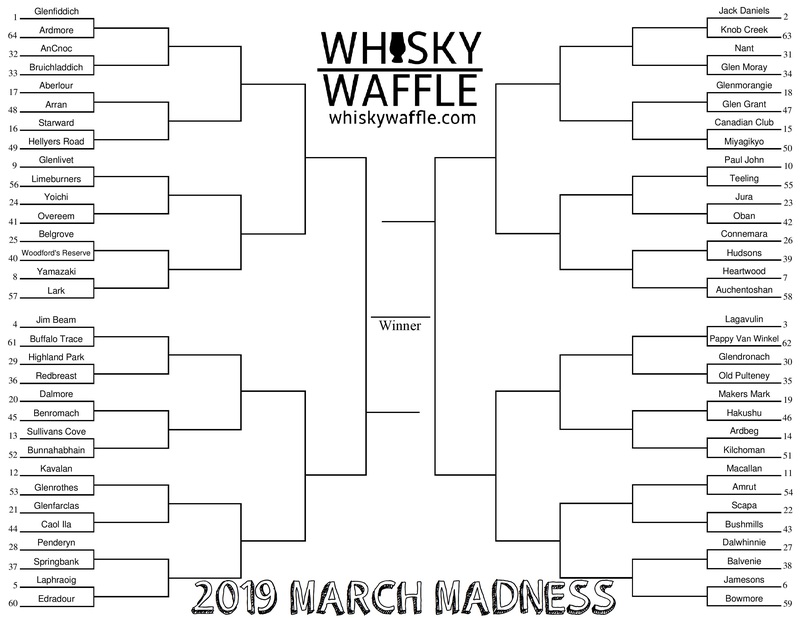 It’s meant to be a bit of whisky-nerdery fun, so start voting and help us find the 2019 March Whisky Madness Champion!